INSET BELOW: A view of the Riva degli Schiavoni from the hotel, and the Savoia & Jolanda's outdoor restaurant. 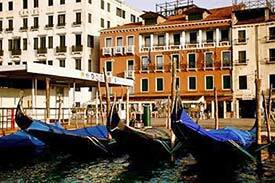 Location: On the Riva degli Schiavoni waterfront, just east of the Piazza San Marco. Closest Alilaguna Airport Boat stop: San Zaccaria. You're willing to pay four-star rates for a 51-room boutique hotel that faces St. Mark's Basin, directly across a wide pedestrian promenade from the Zaccaria airport-boat and vaporetto piers. The Savoia & Jolanda is a traditional upscale Venetian hotel where rooms are likely to have wood-beamed ceilings, Murano glass light fixtures, and--if you've sprung for a deluxe room or junior suite--panoramic views of the Isola di San Giorgio Maggiore and the Venetian Lagoon. In the upper satellite photo, the Savoia & Jolanda is about halfway between the Doge's Palace (left) and the canal on the right side of the frame. It's the red building that faces the second set of waterbus platforms.